A bipartisan-supported program implemented through the Tax Cuts and Jobs Act of 2017 (TCJA) has the potential to unlock development in low-income communities and provide tax relief for investors. Much of the fanfare which surrounded the passage of the Tax Cuts and Jobs Act of 2017, a $1.5 trillion tax overhaul, was focused on the legislation’s implications for economic growth and the benefits to businesses and individuals alike. Unbeknownst to many outside the Beltway, tucked away on page 136 of the 186-page bill was a provision introducing and outlining “opportunity zones,” a potential avenue to defer capital gains tax. As the term garners more attention in the financial media, this blog post highlights some of the key points of the provision, including the structure for investing in opportunity zones and the tax relief they can provide. An opportunity zone is an economically distressed/underdeveloped area where Congress, through tax incentives, is trying to promote investment and spur economic growth and job creation. The zones, created as part of the TCJA, were designated by each state’s governor and approved by the Department of Treasury. At present, there are roughly 8,700 designated population census tracts throughout the United States, including most of Puerto Rico, which qualify as opportunity zones. What are the benefits to taxpayers? Lawmakers hope to incentivize private investors to invest in these low-income areas by providing tax relief and tapping into unrealized capital gains (both short-term and long-term) which, by some estimates, are as high as $3.8 trillion for American households. An investor can elect to defer all or just a portion of capital gains from the sale of an investment and, within 180 days, roll the deferred gain into a Qualified Opportunity Fund (QOF), also known as an “O-Fund.” As outlined in recent IRS guidelines, a taxpayer will likely make deferral elections on a Form 8949 which will then be attached to his federal income tax returns for the taxable year in which the gain would have been recognized if it had not been deferred. A taxpayer may see several tax breaks from his deferral depending upon how long he holds onto the O-Fund investment. Tax Deferral: An investor who rolls capital gains into an O-Fund can defer paying capital gains tax until selling or exiting the fund. This can be highly beneficial for business owners, entrepreneurs, or other investors who hold low-basis stock or who are looking to sell all or a portion of their business and defer some of the capital gains taxes that would be incurred. Tax Reduction: If the taxpayer holds onto the O-Fund for at least five years, he will receive a step-up in basis of 10% of the original deferred gain he elected to invest. If the taxpayer holds the O-Fund for at least seven years, he will receive a step-up in basis of an additional 5%, permanently excluding 15% of the deferred gain. Tax Forgiveness: If the taxpayer holds the O-Fund for more than ten years, he will receive the 15% permanent exclusion of the original deferred gain, and pay no capital gains taxes on any gains the O-Fund accumulates. Given the provision is set to expire on December 31, 2026, there were concerns investors would not be able to act quickly enough to realize the benefits of the tax relief. However, the IRS has noted in recently released guidelines that the ability to make elections is preserved until December 31, 2047. This essentially means an investor has until the end of 2026 to realize an investment gain and until June 2027 (180 days later) to defer the gains into an O-Fund. From there, he can hold onto the investment for ten years and realize the fair market value step-up in basis on his O-Fund gain. The extension until 2047 is intended to allow an orderly divestment of O-Funds, rather than forcing taxpayers to divest with less than desirable market or business conditions. An O-Fund must hold at least 90% of its assets in qualified opportunity zone property (i.e., qualified opportunity zone stock, qualified opportunity zone partnership interests, and qualified opportunity zone business property). Investments can be made into various assets, including equity investments in businesses located within an opportunity zone, as well as real estate projects, infrastructure projects, transportation, etc. It is worth noting here that there is specific testing around the businesses and entities which would qualify, and further clarity is expected. Language in the original bill stipulates a dollar-for-dollar improvement requirement for property projects, meaning if you purchased a $100,000 property in an opportunity zone, then you must invest $100,000 in improvements to the property. Many real-estate investors found the economics of this to be prohibitive; as a result, the IRS has stipulated that the land value of such projects can be excluded. Using the above example, if you purchase the same $100,000 property and the land value is $40,000, then only $60,000 of improvements would be necessary to qualify as an opportunity fund investment. Currently, the guidelines allow any taxpayer or entity to “self-certify” it is a corporation or partnership for tax purposes. There has not been much guidance around how a commingled offering (similar to a traditional real estate or private capital fund) would function; instead, much of direction has skewed towards direct one-time deals and investments. 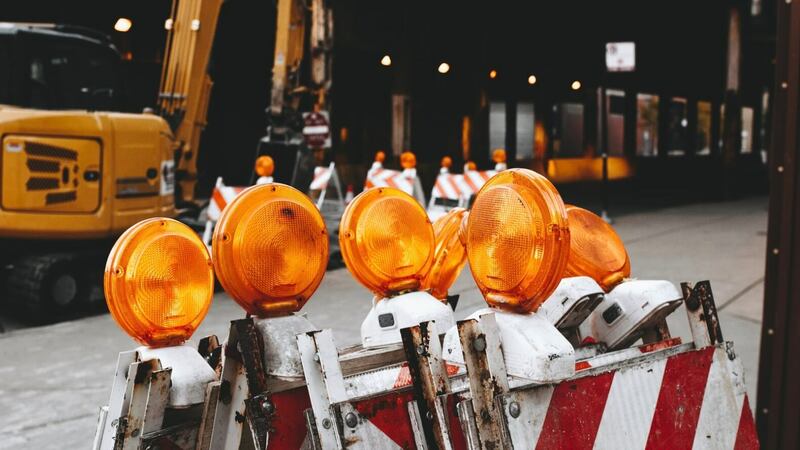 The guidelines allow for an O-Fund to invest in multiple opportunity zone investments simultaneously, but many questions remain around how the reporting and administration would be conducted and monitored. 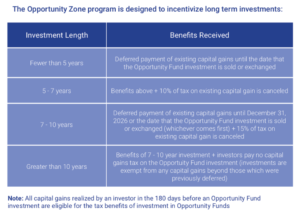 Several investment firms are in the process of raising capital for opportunity zone specific funds, and many others have expressed interest in doing so upon further clarification of the regulations. With the release of updated opportunity zone guidelines last month, many financial publications and networks have started covering the topic. As with all investments, investors must carefully consider the risk/return profile of opportunity funds. Though there are guidelines around opportunity zones, no details have been provided about who can raise money for these ventures or sell interests/partnerships in qualified O-Funds. Many of the managers who step into this space will have little or no experience operating and investing in the areas designated as opportunity zones. As such, it is important to conduct proper due diligence on any investment to fully understand the market, opportunity set, and manager. Congress has designed this provision of the tax bill to be intentionally flexible—allowing for the maximum amount of investment to be attracted to these areas—but markets and market participants like clarity. The IRS and Department of Treasury continue to work through the final details of the opportunity zone program, and we expect additional guidance and regulations to be released by early 2019. So far, the initial guidance and information is promising, and this program has the potential to help many underserved and underdevelopment areas of our country. The entity can be a limited liability company (LLC) which, for federal tax purposes, selects to be organized either as a partnership or corporation.